If you have ever taught Shakespeare’s plays or sonnets, then you know students can struggle to unlock the language and meaning of the text. 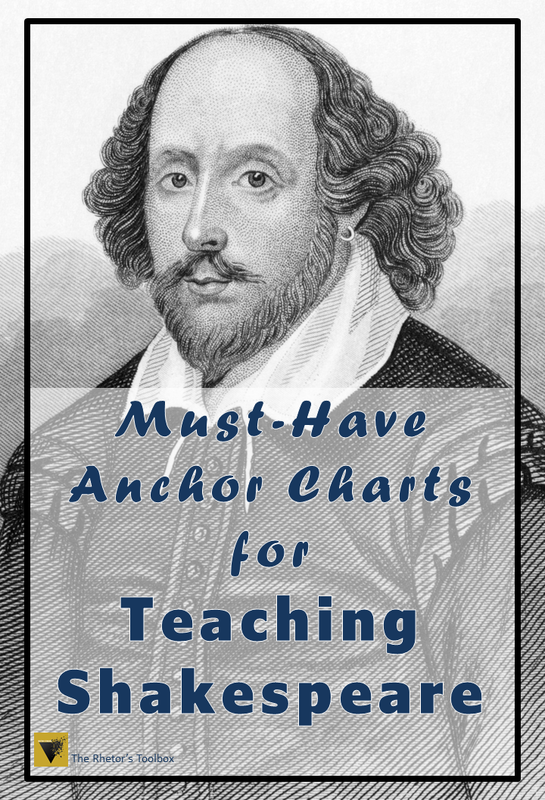 The following two anchor charts have been tremendously helpful in giving my students a process to understand the Bard’s verse. In my classroom, these two posters sit side-by-side. They are the two most often-used anchor charts in my classroom. 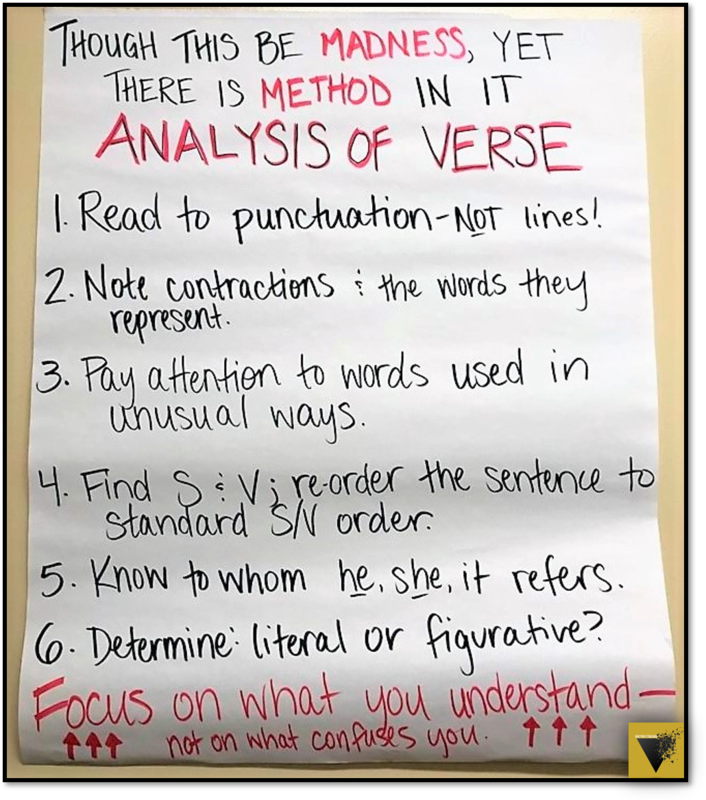 Students need to practice reading verse in sentences, not lines. This takes work! It also requires some modeling. Read slowly, being careful NOT to pause at a line. Read based on the punctuation. It might be helpful to show an entire sentence written out without any line breaks so that students can see it differently. When they analyze, they must be able to recognize the text as sentences, not just lines. Know your contractions. It is absolutely worth a mini-lesson to teach contractions. Students have to recognize which letters have been omitted so that they can make meaning out of unusual contractions. Take time to go over contractions such as on’t (on it) and swounds or zwounds (God’s wounds). Don’t let students skip over contractions in their reading for comprehension or analysis. Initially, students may think that all of Shakespeare’s words are used in unusual ways. Really, though, they need to be able to recognize common schemes. Mini-lessons around omission, repetition, and inverted word order are vital. I like to use a word sort and a I Have, Who Has game to teach these concepts. This one ties in to number three; it’s a great opportunity to revisit subject and verb identification. If you are an AP English teacher, this is great to use with antecedent questions in multiple choice, as the subject and verb are often split by a lengthy appositive. Pronouns and antecedents are sometimes confusing in Shakespeare’s work. Especially in soliloquies, take time to clarify to what or whom pronouns are referring. This is a critical question. 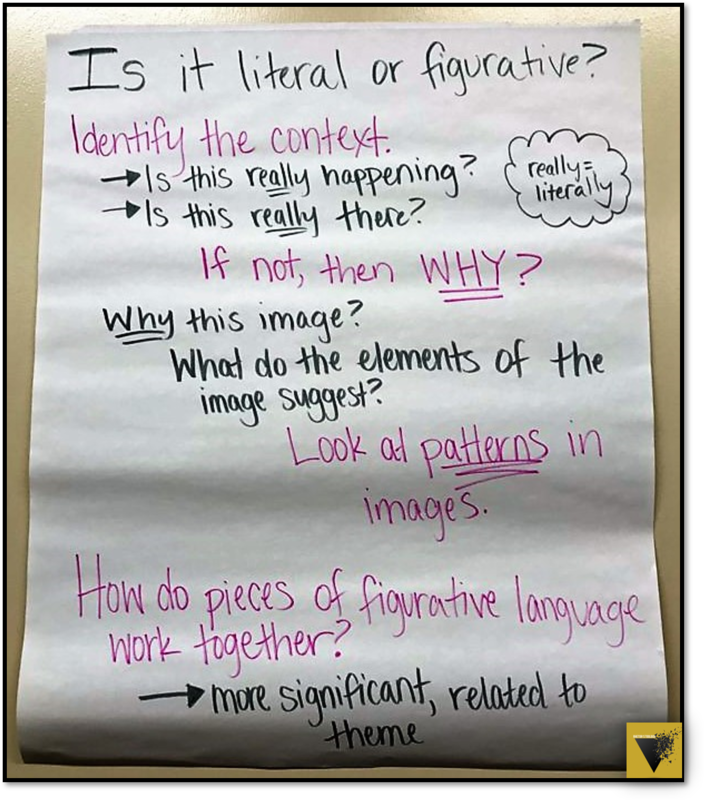 It’s so critical, in fact, that the next anchor chart provides instructions for distinguishing between literal and figurative. Make sure students understand that Shakespeare often layers both literal and figurative meanings, so they need to understand the implications of both. When a student is trying to determine literal vs. figurative meaning, he or she must understand the context of the image, statement, etc. If the context indicates that something is really happening or really there, it’s literal. If the context suggests that something is not really happening or really there, it is likely figurative. To analyze this language, the student must now delve into the why and the so what. The student should look at any patterns, shifts, and repetition. The student must also consider how multiple instances of figurative language suggest more significant meaning, which is usually related to theme. Students are entirely capable of reading and understanding Shakespeare’s works; they simply need a few tools to interpret what may feel like a “foreign” language. Help them focus on what they understand, not on the gaps–as they start to see their strengths as readers, they will gain confidence in their ability to navigate Shakespeare’s verse.